Loaded Tater Tots - crispy tater tots, four cheese alfredo, smoked gouda, candied jalapenos, bacon. Easily my favorite dish of the evening. These tater tots were so tasty. They had crispy exteriors and soft interiors. I could eat these without the cheeses and bacon, but those things just make them even more delicious & decadent. 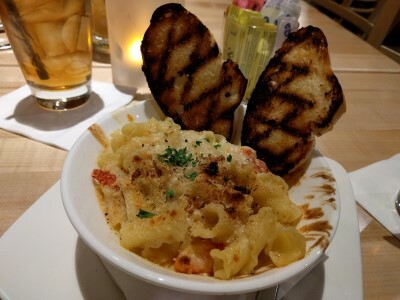 Lobster Mac & Cheese - alfredo, lobster, baked parmesan bread crumb crust. 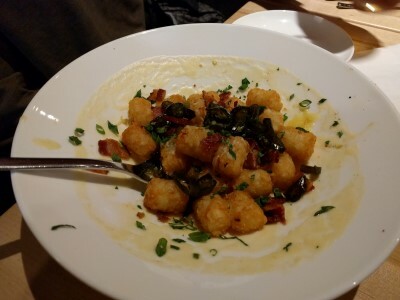 The mac & cheese is quite good, but the tater tots were so good that we couldn't stop eating them and then we had no room for a pasta appetizer. We had a couple bites and took the rest home for lunch the next day. 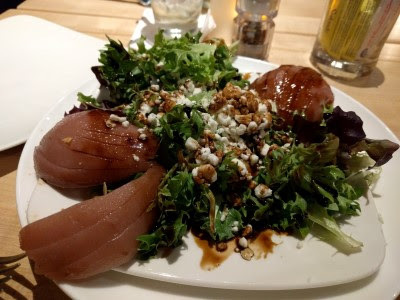 We shared a salad special, a Poached Pear Salad with feta (or maybe goat cheese, I cannot remember), mixed greens, balsamic, and walnuts (I think). Lots of pear, crisp greens, good sized salad for sharing. 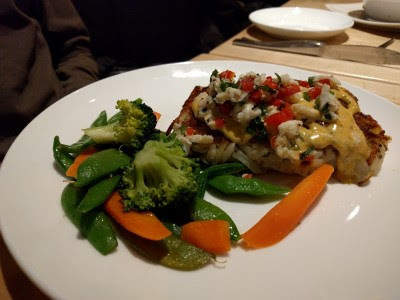 SP chose Lightly Crusted Atlantic Cod - crispy shredded potato, horseradish-herb crust, Old Bay remoulade, lump crab relish. It came with vegetables and another side (SP chose sweet potato fries). He said it was as good as he remembered from November. The fries were fat fries and we both prefer skinny fries. 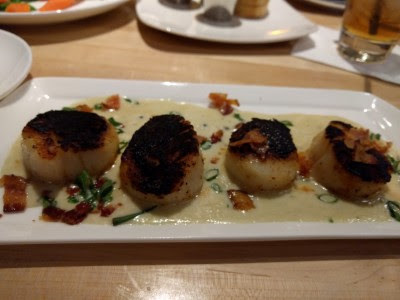 I chose an entree special: Seared Scallops with Cajun seasoning and a bacon-blue cheese sauce. I was stuffed from the tater tots and salad, so I managed to eat just 1.5 scallops. They were good, but I should have known better than to order something with Cajun seasoning since spice like that usually bothers me (it did later that night). The sauce was delicious. 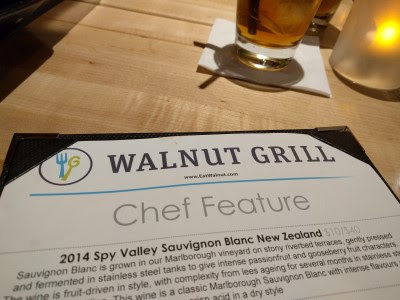 We enjoyed our meal at Walnut Grill, especially the tater tots and salad. It's a nice addition to the restaurants at Settlers Ridge (it fills the spot previously occupied by Stonepepper Grill). Our server was attentive and made sure to check with us that everything was OK when she noticed we didn't eat much of the mac & cheese. I like that there's room between tables, you're not crammed in next to other diners.